Lucknow: The third death anniversary of Maulana Mirza Athar was held at Hussainia Asafoud-Daula (Bada Imambara) in Lucknow on Sunday. A huge number of people from India and outside India attended the day long programme. Participants from India were mainly from Uttar Pradesh, Karnataka, Andra Pradesh, Maharashtra, Gujarat, West Bengal and Delhi. The day long Majlis was started by the recitation of Holy Quran following which Professor Aziz Banarasi, Nazir Baqri, Raza Halori, Fakhir Merathi recited poetry. Dr Dinesh Sharma, Deputy Chief Minister, Uttar Pradesh was a guest and inaugurated the photo exhibition of S.N Lal and Azam Hussain. Maulana Yasoob Abbas, his brothers Maulna Ejaz Athar and large number of people gave a warm welcome to Dr. Dinesh Sharma. Dr. Dinesh Sharma while speaking on the occasion said Khateeb e Akhbar (Senior most orator) has not only worked in the field of knowledge but has also much contribution in the upliftment of society and nation. He stressed that Maulana in his lectures always used to give message of unity and brotherhood. Uttar Pradesh Minister of Law and Justice, Brajesh Pathak while paying tributes to Maulana Mirza Athar said that the candle of knowledge that was lit by Maulana Athar is still enlightening people. He also hailed Maulana stating that after 9/11 attack he was the first person who gave lectures against terrorism in Mumbai. Hujjatul Islam Agha Syed Makki Al Milani from Najaf while addressing the people said Maulana Mirza Athar for whole life spoke for truth with honesty. Incharge of Shrine of Imam Hussain (a.s) Syed Aala Zaiudin, while praising Maulana Mirza Athar for speaking of Ahlulbait (a.s) said that as a part of our responsibility we are confronting terrorism from pulpit and Majalis ( congregation gatherings) and added how Daesh was defeated in Iraq. Swami Sarang Ji, who practices Hinduism, while speaking on the occasion said that Maulana Mirza Athar always stressed on love and humanity in his sermons adding that he was not only a good cleric but also a good human being and that is the reason that even after three years of his demise people are still remembering him. 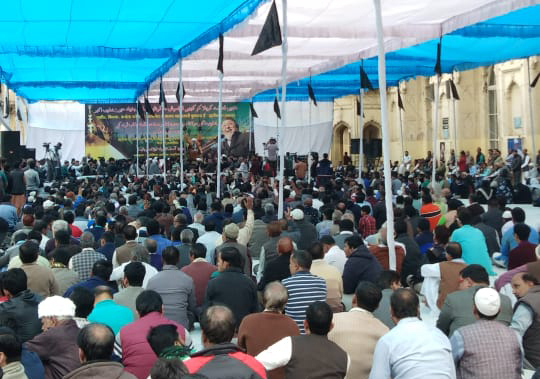 Ayatollah Hassan Raza Ghadeeri while addressing to people said that Maulana Mirza Athar throughout his life spoke of Ahlulbait (a.s) in his speechs and such love is there in the hearts of people for him that people around the world still miss him. He further added that like father, the sons of late Mirza Mohammad Athar- Maulana Yasoob Abbas, Maulana Ejaz Athar are walking on the footsteps of their father in their service for Ahlulbait (a.s). He concluded his speech by mentioning tragedy of Karbala and attendants mourned afterwards. A delegation from Markazai Zahra Najaf that was headed by Hujjatul Islam Agha Syed Makki Al Milani had also come to attend the programme. It included Hujjatul Islam Hashim Raza Gadeeri, Hujjatul Islam Ali Abbas Najafi, Hujjatul Islam Qamar Jafari, Hujjatul Islam Showkat Razvi. From France Hujjatul Islam Shamsher Mukhtari was also present. Khadim of Shrine of Imam Hussain, Amjad Alkalbi had also come from Karbala, Iraq and attended the day long programme. Former Governor of Assam and Jharkhand Syed Sibtey Razi, Former Ministers Esa Raza and Shabab Zaidi also were also among the attendants. Apart from these dignitaries people from all walks of life attended the programme including scholars, clerics, students etc. Maulana Yasoob Abbas on behalf of the family of Maulana Mirza Mohammad presented vote of thanks. Maulana Mirza Mohammad Athar was the President of All India Shia Personal Law Board. He was conferred the title of ‘Khateeb-e-Akbar’ (Senior most orator) in the Shia community in India and was named in Limca Book of Records for reciting Majlis at historic Mughal Masjid for more than 55 years. It was first of its kind that a cleric recited Majlis at same place for more than five decades. Born in 1936, Maulana Mirza Mohammad Athar was the son of the late Maulana Mirza Mohammad Tahir, a noted Shia Muslim Scholar. He received the traditional Islamic education at Sultan-ul-Madaris in Lucknow where he graduated with Sadr-ul-Afazil. He then got a Bachelor’s and Master’s degree in Persian from Lucknow University. He served as Head of the Department of Persian and later as Principal at the Shia Degree College Lucknow. 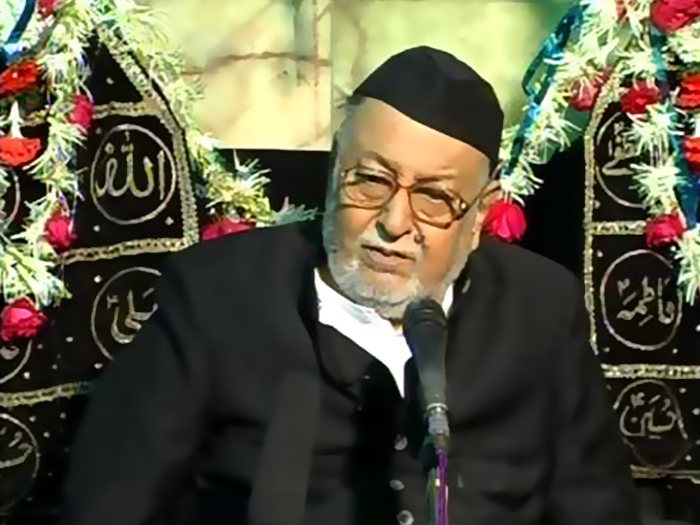 In 2008, he completed fifty years of continuous Muharram recitation in Mumbai. In addition to his native Lucknow, he was popular all over India as well as in Pakistan, Middle East, UK, US and Australia. On 23 January 2005, he was elected first president of All India Shia Personal Law Board (AISPLB).